It’s been nearly two weeks since I’ve seen a combo mouse worth writing about. I’ve seen plenty of mice that try to pass themselves off as headsets, pointers and even a really weird label printer. However, this is the first time I’ve seen one that’s also a gamepad. I think that the Genius Navigator 365 mouse may actually be something worth your time (and money). Were this an everyday mouse meant to hook up to your desktop, I wouldn’t likely recommend it. When you take into account the fact that this is a small travel mouse meant to be carried with your laptop, it seems perfect. I can’t count the number of times I was stuck in a very boring hotel room and would have killed to play some old-school MegaMan with a decent gamepad. Of course, the word “decent” will play an important role with this mouse. 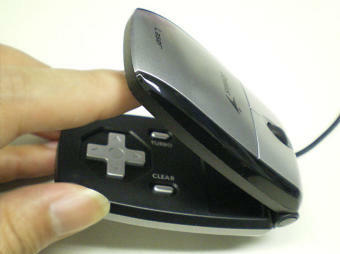 It looks like the buttons might be a little uncomfortable for use, but at least it looks like a good mouse. Either way, it’s not bad for $33. That’s so cool, I want one!